[The] revolution may have been misunderstood and underestimated by many Americans. President Reagan and his revolutionaries were not mincing words. They intended to effect a permanent revolutionary change to the U.S. system of government. They planned to catch the pendulum as it swung to the right and weld it in place, where it could never swing back to the left. Like committed revolutionaries, they were profoundly irreverent of sacred institutions. Reagan's first term in office was deliberately provocative. He preached that nuclear war was survivable; that we might drop "demonstration" weapons on Europe to intimidate the Soviets. He joked (once accidentally, on a live radio show) that he had already launched U.S. missiles against the Soviet Union. Jerry Falwell, who preached that nuclear Armageddon might be God's instrument for taking his chosen up on high, was a regular visitor to the White House. Reagan was openly contemptuous of environmental concerns: "If you've seen one redwood you've seen them all." He appointed James Watt, who systematically opened millions of acres of government land to commercial exploitation, to the Interior Department and Ann Burford, who used the Environmental Protection Agency (EPA) to protect corporations that were dumping and poisoning. Reagan willfully assaulted the human services infrastructure in the United States, boasting that he had eliminated over 1000 programs that served lower income groups. He proposed that ketchup and pickle relish would suffice for vegetables in school lunches. He raised taxes for the poor and middle class while slashing them by 60 percent for the ultra-rich. He put Elliott Abrams into the Human Rights Division of the State Department with orders to dismantle it. The Reagan administration sent the files of confidential testimonials that Pat Derian, under President Jimmy Carter, had accumulated from refugees from repressive countries to the police in those countries. Then the Immigration and Naturalization Services deported the refugees to countries where brutal police were waiting for them at the airports. President Reagan and his attorney general, Edwin Meese III, whose personal corruption came under investigation, ridiculed the plight of the poor and challenged the Constitution itself, saying that it was only a piece of paper. Meese repeatedly asserted the principle that arrested people were to be considered guilty until proven otherwise. Reagan put his and Meese's California friend Luis Guiffrida in charge of the Federal Emergency Management Agency (FEMA), which laid plans to suspend the Constitution, declare martial law, and intern several hundred thousand people without due process. Secretary of State George Shultz lobbied vigorously (with indirect success) for a pre-emptive strikes bill that would give him authority to list "known and suspected terrorists" within the United States who could be attacked and killed by government agents with impunity. Shultz admitted (in a public address in October 25, 1984) that the strikes would take place on the basis of information that would never stand up in a court of law and that innocent people would be killed in the process. He insisted, however, that people listed would not be permitted to sue in court to have their names taken off that list. Many other laws were passed in favor of the national security complex at the expense of civil liberties. By the end of his eight years in office, President Reagan was also boasting that he had appointed 45 percent of the sitting federal judges. He tacitly encouraged the corruption and irresponsibility that eventually led to the Savings and Loan scandal and to 200 of Reagan's officials being indicted, investigated, or fired for corruption. Only Ronald Reagan, the "Great Communicator" (also called, by the Washington Post, the "Great Prevaricator") could have been such an effective point man for an irresponsible "revolution" that assaulted and violated the most profound U.S. traditions and institutions. This was at the end of the 10-year war that followed a previous decade of CIA activity in Vietnam. Two million people- had been killed. The equivalent of one 500-pound bomb had been dropped on the country [Vietnam] for every citizen. Ninety-thousand tons of carcinogenic and toxic materials had been dropped on the country, some of which would poison it for decades to come. We were returning to the "World," to continue our lives, while leaving our Vietnamese cohorts behind. In the meetings of the National Security Council, busy, _ important men come together to make decisions about U.S. policy on various problems all over the world. The Secretary of State, Secretary of Defense, Vice-President, sometimes the President, the CIA Director, people like that, with enormous responsibilities and power. They are aware of their power. The etiquette is that they do not keep each other waiting. They try not to show up 30 minutes late to those meetings, because the other people are powerful and busy too-and they really are busy. That is one thing I noticed about people in those positions: they do work hard, long hours, long days, lots of meetings, keeping a lot of balls in the air. In the first briefings on the Angola operation, the CIA Director, William Colby, with an aide with a flip chart, literally said, "Gentleman, this is a map of Africa. Here is Angola. Now, there are three factions in Angola. The FNLA (National Front for the Liberation of Angola), they are the Good Guys; we have been working with them for fourteen years." And then he described the FNLA, and Holden Roberto, our rebarbative ally. Then he said, "The MPLA (Popular Movement for the Liberation of Angola), they are the Bad Guys, led by the drunken psychotic poet"-that was what we had written into the briefing material-"Augustino Neto." And he used those words-"Good Guys" and "Bad Guys"-so these busy men would not be confused about the issues, and proceeded to brief them. One day Henry Kissinger came to the meeting late, and everyone had to wait. Now mind you, this is not a meeting of the Supreme Court, where law prescribes where everybody sits, according to seniority. The National Security Council, at least at that time, met in an office in the White House, wit-in an oak table and some drapes and some maps, but no electronic flashing boards or anything like that. People sat around the great big table, with the staffers sitting in an outer ring of chairs so they could lean forward to advise their individual masters. Often staffers were not present when sensitive decisions were being made. The Secretary of Defense plopped down in a chair to talk to somebody while we waited for Kissinger, and then Kissinger came steaming in and he told the Secretary of Defense, "I am here. We can go to work. Move down to your chair." To which the Secretary of Defense replied, "Well, I am all spread out here. You sit there today." And Kissinger said, "No, I am the Secretary of State, this is my chair. You sit down there." They proceeded to argue like five-year-olds for about five minutes. Eventually the Secretary of Defense would not move, and Kissinger had to go sit down at the far end of the table, but he turned his back on the briefings and sulked. He wouldn't pay attention to what we were saying that day because he couldn't have his chair-and we were making decisions that were getting people killed in Angola. I am not exaggerating that incident one bit. When the operation was formally launched by the National Security Council in January 1975, Angola was moving toward peaceful elections as it gained its independence. The CIA introduced fighting forces into the country, forcing a violent, undemocratic solution instead. (See the Angola section of the next chapter for a summary of the entire fiasco.) The program was stopped by the U.S. Congress in the winter of 1975-76. I spent six months reviewing the files and then resigned from the agency. After publishing a letter in the Washington Post on April 10, 1977, I testified for five days to congressional committees, eschewing the protections of the Fifth Amendment, while I gave them chapter and verse of what we had done in the misguided Angola operation. I gave them the numbers, dates and texts of cables and memoranda that proved we had broken laws and then lied about breaking them. I gave them the combinations to the safes where the documents were stored, and told them where in CIA headquarters those safes could be found. I challenged them to investigate thoroughly and do their duty. They did nothing. The hearings had been conducted in secret, and after the Watergate scandal, the ouster of President Nixon, and the defeat in Vietnam, they were not willing to tackle another big scandal that might oblige them to put Henry Kissinger and the CIA Director in jail. I proceeded to write my first book, In Search of Enemies, to make the public aware of what had happened so they could judge for themselves. It remains today the only insider's account of a major CIA operation. A year later, when Congress had had abundant time to investigate the secret scandal and prosecute the felons involved, In Search of Enemies was published. Without claiming that the book revealed any sensitive secrets, the CIA sued me and succeeded in seizing all future earnings. They also placed me under a court order which requires that all future writings for publication be submitted to the CIA Publications Review Board for censorship. Since then, I have been on the greatest human adventure imaginable, of growth and of learning all the things about the world that they did not teach us in college. I began to read book after book about the United States and world security problems, and to meet the authors of some of them and talk to them about their findings. I travelled to countries that had been the targets of CIA destabilizations, including Grenada, Jamaica, Cuba, Nicaragua, El Salvador, Honduras, Panama, and Vietnam. In my travels I met people like Carl Sagan, Admiral Gene LaRocque Admiral Gene Carroll, Jr., Director of the Center for Defense Information, anti-nuclear activist Helen Caldicott, Daniel Ortega, the martyred Grenadan leaderMaunce Bishop, and numerous other authorities on national security and the nuclear arms race. I was invited to lecture and have addressed over 600 audiences, learning much from them in return. I have enjoyed the experience more than I could ever have imagined. Much of this learning process was very personal. In March 1963 I was in Grenada for the anniversary celebration of the New Jewel Movement's takeover. At a cocktail party in a garden overlooking the Caribbean we received the news that President Reagan had given a speech announcing that Grenada was a threat to U.S. national security. The Minister of Education, Jacqueline Creft joked that they had been caught on the eve of their attack on the United States. She said their armies were about to take Washington and New York (Grenada is a small island, about 8 by 16 miles, with 80,000 people, and at the time had two poorly trained and equipped parapolice companies in its armed forces). They would sweep west and capture Chicago by the early summer and then launch their march on California. Everyone laughed, but I pointed out that President Reagan's speech wasn't really funny. If, out of all the million important things he could mention in a public address, he focusses on a country like Grenada and asserts that it is a threat to the "national security" it means that he is drawing attention to it in preparation for attacking it. Creft flared back at me, noting that I didn't need to lecture them about U.S. policy. They had been living under the wing and talon of the U.S. eagle for centuries; they knew its dangerous ways too well. But she was glad I was beginning to understand. As I learned more and more about the history and cynicism of the CIA's so-called secret wars, I also became more concerned about other major problems of world security, including the nuclear arms race, drug smuggling, the abuse of the environment, and the coming world economic crisis. Until we learn to control human behavior at the level of covert destabilizations against countries like Nicaragua, for example, I doubt seriously whether we shall be safe from the planet-threatening aspects of the nuclear arms race. ... In April 1974, the [Angolan] army rebelled in a coup in Portugal, making it clear that the colony of Angola, where a prolonged independence struggle had been fought, would be granted its freedom. The superpowers quickly chose sides between the three competing factions. The United States automatically sided with the FNLA (Front for the National Liberation of Angola), with whose leader, Holden Roberto, it had maintained contact over the years. In fact, Roberto was close to the Zairian President Mobutu Sese Seku, whom the CIA had installed and maintained in power since 1961. Historically the Soviet Union had generally sided with the MPLA (Popular Movement for the Liberation of Angola), although contact had been disrupted in the years preceding 1974. Reacting to Soviet policy, Communist China sent 400 tons of arms to the FNLA, and over 100 advisors. A third movement, UNITA (the National Union for the Independence of Angola), was left without a major sponsor. Led by Jonas Savimbi, it was historically the most radical of the three parties having received aid from China, North Korea, South Africa, and others over the years. In January 1975, leaders of the three movements met under Portuguese arbitration and signed the Alvor Accord in which they agreed to compete peacefully in elections that would be held in October. November 11 was fixed as the anticipated date of independence. Within a week, the National Security Council met in Washington D.C. and allocated $300,000 for the FNLA's use in the political campaign. The FNLA had sufficient arms from the Chinese and from Zaire and a record of bloody violence against the Portuguese and the MPLA. The CIA station chief in Kinshasa urged Roberto to move his FNLA forces inside Angola. His men went in armed and soon attacked and killed a team of MPLA organizers. At that moment the Alvor Accord was effectively sabotaged and the fate of Angola sealed in blood. During the spring all of the factions scrambled to organize, obtain arms, and establish control over whatever territory they could. The MPLA was by far the most successful. By mid-summer, it controlled 13 of the 15 provinces. The National Security Council, which was dominated by Henry Kissinger, demanded a paper outlining possible options from the CIA. This was July 1975, just three months after the last helicopter had left the embassy rooftop in Saigon, marking the decisive end of the Vietnam War. Many, including CIA Director William Colby were surprised that the CIA would move so quickly into another adventure. The CIA's paper offered four options: one for $600,000 which would provide political support for the FNLA, one for $6 millionwhichwould include some military support, one for $14 million which would involve substantial military; and one for $40 million. The $40 million, it was estimated, would equal anything the Soviet Union was likely to try in Angola. These options and the estimate of the Soviet reaction were not the result of a massive study. The CIA's Africa Division chief and his staff plucked the figures out of a round table discussion, and Colby relayed them to Henry Kissinger as authoritative. It must be noted that neither the Africa Division chief nor his deputy had any substantive experience in Africa. One had spent his career in Europe, the other in the Pacific Basin. Only the deputy had any substantive experience in managing paramilitary activity: he had been part of the programs that had just dramatically failed in Southeast Asia, and had never set foot in Africa. A fifth option, staying out of the conflict and letting Angola make its own way toward independence, was not included in the paper. Was this a viable option? The Assistant Secretary of State for African Affairs, Ambassador Nathaniel Davis, firmly believed so. Of the proposed CIA program, he said, "It's the wrong game for a great nation, and the players we've got are losers." The U.S. Consul General in the Angolan capital of Luanda, Tom Killoran, who was the only senior American diplomat who had worked with all three Angolan movements, firmly believed that the MPLA was in fact the best organized, the most likely to prevail, and ultimately the friendliest to U.S. interests. Kissinger picked the second option, then decided $6 million didn't sound impressive and cabled Langley from a Paris trip authorizing $14 million. The CIA quickly mobilized to support the FNLA, fighting the MPLA. Just returned from the evacuation of Saigon, I was ordered to put the CIA's task force together and manage the secret war under the supervision of the CIA's Africa Division chief in Langley and the National Security Council's Interagency Working Group on Angola. One month after we were formally committed to the secret war, I was sent inside Angola to assess the competing forces. I found that Roberto's forces were disorganized and numbered one-hundredth as many as he told us. Savimbi's UNITA forces seemed determined and he was scrupulously honest in the counts and estimates he gave us. We decided to co-opt him into our program. Throughout the fall of 1975, arms were jammed into Angola, mercenaries were hired, battles were fought, and several thousand people were killed and wounded. The United States actively discouraged United Nations and other formal efforts to mediate. Our budget eventually totalled $31.7 million, a good part of which was siphoned off into corruption. We encouraged South African forces to support our Good Guys, while Cuban soldiers joined the MPLA Baddies. By winter, the program was thoroughly exposed and the Congress mercifully passed the Tunney Amendment to the FY 76 Defense Appropriation Bill that ordered our operation closed down. In the field, our forces had been routed and the MPLA effectively controlled all of the provinces. We had given Jonas Savimbi the wherewithal to keep the Benguela Railroad closed, which was our client-state Zaire's only economically viable egress to the sea for its copper. We had lied to nearly everyone, lies that were quickly exposed. Some of those lies to the U.S. Congress, covering up what we had done, amounted to perjury and could have been prosecuted as such. We had allied the United States with South Africa in military activities, which was illegal and impolitic. We had delivered white mercenaries into Angola to kill blacks as a technique of imposing our policies on that black African country. Meanwhile, we-not the "Communists"-had interfered with U.S. commercial interests. We had withdrawn Boeing Aircraft Corportion's licenses to sell five jetliners to the Angolan airlines, and we had blackmailed Gulf Oil Company into putting its $100 million payments in escrow instead of delivering them to the Bank of Angola. We had poisoned the missionaries' efforts to run vital schools and hospitals. Our experience with Gulf Qil Company and Boeing Aircraft Corporation left me with an initial misperception of the CIA's involvement with multinational corporations. These two companies were frustrated and inconvenienced by the CIA's secret war in Angola. It cost them money. George Wilson, the President of Boeing, flew to Washington to protest and clear the licenses to sell his airliners to the Angolan government. In my first lectures after leaving the government, I reported that the CIA and the big corporations were, in my own experience, out of step with each other. Later I realized that they may argue about details of strategy-a small war here or there. However, both are vigorously committed to supporting the system. Corporate leaders fight amongst themselves like people m any human endeavor. They raid and hostilely take over each other's companies. Losers have been known to commit suicide. However, they firmly believe in the capitalist system. In two short meetings in Washington, we managed to turn the Boeing President George Wilson around to the point where he sent a letter that we had drafted to the new government of Angola, warning them that the price of crossing the U.S. (secret) government was the loss of access to U.S. technology. In sum, we had severely damaged U.S. national security interests and nailed our own country with another defeat on the heels of Vietnam. In one of the classic, ironic follies of intelligence charades, Gulf Oil Company employees returned immediately to resume pumping the Angolan oil-protected militarily by Cuban soldiers from CIA mercenaries who were still marauding and destabilizing the countryside. Nor did the Angola tragedy end with the CIA's defeat in the winter of 1976. Under President Reagan, congressional restraints were lifted and the CLA resumed its support of Jonas Savimbi and his UNITA forces. Over the years the continued destabilization has taken a horrendous toll: the Red Cross counts over 20,000 walking-maimed in Angola today and the central part of the country, which used to be its bread basket, is now a recognized zone of famine. ... The first year of the Nicaraguan operation was almost eerily like the one in Angola. There were three competing factions in each: the leaders in the north, Holden Roberto of the FNLA (in Angola) and Adolfo Calero of UNO (in Nicaragua) were rebarbative characters, while the leaders of the southern movements in each country, Jonas Savimbi (in Angola) and Eden Pastora (in Nicaragua) were remarkably charismatic. In each country, the CIA purchased SWIFT attack launches for coastal operations and put together ragtag air-transport proprietaries. After a couple of years, the Nicaraguan operation began to manifest a substantially different personality. For one thing it became a major artery in drug smuggling, which was not a factor in Angola. For analytical purposes, the Nicaraguan operation will remain one of the best historical examples because the target country was closer to the United States culturally and geographically, and because the Nicaraguan destabilization was quite open on both ends, i.e., in Washington and in Managua. Usually these activities are closed-they are secret. In most cases our government covers them and hides them to the greatest degree it can, and the country we are attacking becomes hostile and seals its borders to us. Nicaragua, until quite recently, had a policy of remaining open. Anyone from the United States who wanted to go down and have a look could do so without a visa. Meanwhile in Washington the program was debated quite openly as the administration battled for funds and operational details were discussed publicly. Throughout the 1980s, I traveled back and forth from Washington to Nicaragua and elsewhere, informing myself, witnessing and analyzing the operation, and also discussing it in hundreds of lectures. Nicaragua is unlike Angola in that there never was a chance in Angola that we would make it into another Vietnam, by putting in U.S. troops, whereas this was a very real possibility in Nicaragua during the mid-1980s. The United States has had a fixation on Nicaragua since the mid-l800s. It has long been the ideal site of a possible second canal, better than the Panama canal, connecting the Pacific and Atlantic Oceans, and the target of military intervention. The United States put the Marines into the country half a dozen times early in this century to occupy it, to dominate it, to force elections, to control business interests in that country. The Marines were eventually withdrawn in 1933 as a result of international pressure, of the international peace movement, and the United States switched to a more subtle form of control than gunboat diplomacy. We created and left behind a National Guard with officers trained in the United States who would be loyal to our interests. This arrangement was the decisive feature of the new era of neocolonialism. With a brief interruption during World War II, the creation l of military oligarchies became a standard U.S. policy of control. We set up schools and eventually trained tens of thousands of military and police officers in countries all over Latin and Central America, in Africa in three cases (Zaire, Ethiopia, and to a lesser extent in Uganda), and in Asia. We put them through our military and police academies, armed them, directly or indirectly paid their salaries when they returned home, and created an international military fraternity of people in power in these countries who were more closely identified with our own military, and hence U.S. national interests and capitalist values, than they were with the people of their own countries. Meanwhile the cat-and-mouse game that we played with Nicaragua starting in 1981 isle classic case of "destabilization". The strategy, according to the State Department, was to "attack the country's economy." Note how indifferent that sounds from "brutal wreckage" and perhaps you can understand how those people in Washington, most of whom are perfectly decent human beings, can manage activities that cause so much human suffering. It is the magic of rationalization. After all, attacking a Communist country's economy was something every patriotic citizen of the United States was expected to applaud every morning before breakfast. The point of a destabilization is to put pressure on the targeted government by ripping apart the social and economic fabric of the country. These are only words, "social and economic fabric," but what they mean is making the people suffer as much as you can until the country plunges into chaos, until at some point you can step in and impose your choice of government on that country a strategy that was ultimately successful in the Nicaraguan elections when the people of that country "cried uncle" and voted for the CIA collaborator, Violeta Chamorro.9 The rationales we used in Nicaragua were classic Cold War slogans: we were "fighting Communism" in the interests of our "national security"; they were a "Marxist bastion in our ownbackyard"; etc. More specifically, our leaders said at first that the purpose of this program was to "interdict the alleged flow of arms from Nicaragua to the rebels in El Salvador." Unable to prove any flow of arms whatsoever from Nicaragua into El Salvador, the Reagan team, followed eventually by George Bush, developed the propaganda line that they were "returning Nicaragua to democracy." When it was pointed out that Nicaragua had never had a democracy-certainly not under the brutal Somoza dictatorship-they began to speak of the "democratization of Nicaragua," ignoring the fact that Nicaragua had held elections in 1984 that were demonstrably more democratic than the elections that we have in our own Republic. We will never know exactly what the Sandinistas would have done with Nicaragua if we had left them alone to tackle the country's staggering problems (many of which were the legacy of the Somoza regime) according to their own interests and ideology and compulsions. Everything they did after taking power in 1979 had been in the shadow of U.S. manipulations and covert military attacks on their country. We do know however that there was no blood bath when they took over. They abolished the death sentence at exactly the same time the United States was reinstituting it. The maximum penalty in their courts is 30 years in jail. They released thousands of the hated National Guardsmen that they had in their custody, saying that they would not jail anyone just for having belonged to an organization; the Guardsmen would have to be convicted of individual crimes. This contrasts dramatically with Cuba: when Castro triumphed in 1959, there were a number of executions, generally following trials and sentencing. Of course, the Sandinistas' generosity cost them: many of the Guardsmen they released joined the contras in attacking the country. The Sandinistas launched a literacy campaign to teach every Nicaraguan to read and write and they set out to build 2,500 clinics so Nicaraguans would have access to some kind of medical treatment. These are things that Somoza, the dictator backed by the United States, had not gotten around to doing, and in fact were openly scorned by the dictator and his family. The first official action taken by the Sandinistas was to establish a ministry of the environment to tackle the damage done under Somoza, who had permitted commercial interests to dump toxic wastes in and thereby "kill" the country's two huge, beautiful lakes. The Sandinistas then launched the most ambitious land reform campaign in the history of Central America. They did this by maintaining a free-enterprise economy with less governmental interference and corruption than Mexico, Peru, or Brazil. Private businessmen could obtain permits, rent an office, install a telephone, and open a business. They could buy land and farm it. If you owned land and you were working it, you kept it. They expropriated the lands that Somoza and his family, and the people who fled, had earned or stolen or taken, and they turned those lands back to the people in cooperatives and different programs, feeling their way, making mistakes as they went, trying this solution and that one, but with the purpose of getting the land back to the people so farmers would own the land, relate to the land, and profit from the land that they worked on in their own country. In the first four years after the revolution, Nicaragua had the greatest rate of growth of any Latin American country. The Sandinistas insisted that the church should be a church of the people, the church of the poor-not another tool of the oligarchy and the rich and the wealthy. I visited Tomas gorge's office, the Minister of the Interior, and counted the 25 Catholic icon collector items that he had mounted on the wall. During the Somoza years, Borge was imprisoned and tortured. His wife was imprisoned, raped, tortured, and killed. As Minister of the Interior, he had the men responsible in his power but he did not take revenge on them. In the 10-year continuous attack-"war" is what the World Court called it-that the United States waged on Nicaragua, Nicaragua did not commit one act of war against the United States. But instead of joining them in building the healthiest, most dynamic, most enthusiastic country in Central America, the U.S. spent over $1 billion to attack and destabilize the country. We set out systematically to create conditions where farmers could not get their produce to market, where children could not go to school, where women were terrified of being attacked, inside their homes as well as outside, where the hospitals were treating wounded people instead of sick people, where government administration ground to a halt, where the trucks didn't run, the bridges were blown up, the salaries weren't paid, and the infrastructure broke down. Eventually, of course, international capital was scared away and the country plunged into chaos and bankruptcy. We created the contra program beginning in about 1981. Here we go again, said Newsweek in November 1982, we have done this before; it has been a mistake before; once again we are supporting the wrong side. We had elected to support the only "truly evil, totally unacceptable faction in the Nicaraguan equation"-the remnants of Somoza's hated Guardia Nacional (National Guard). Using Argentine trainers at first, and then eventually CIA mercenaries, we armed and directed this small army from bases mostly in Honduras to attack inside Nicaragua and destabilize the country. They systematically blew up granaries, sawmills, bridges, government offices, schools, health centers, mines. They mined roads, ambushed trucks, and raided farms and villages. There is massive documentation of all this- because, as I said, the country was kept open for foreign witnesses to record what was happening. For the first few years, CBS, NBC, ABC, BBC, CBC all had crews in Managua, and when there would be atrocities they would rush to film them. We also had what eventually totalled thousands of witnesses for peace from this country, Canada, Europe, and Australia, going down and visiting or even living right in the Nicaraguan towns and villages with the people, and when there were atrocities they filmed and photographed and documented them. There was also direct U.S. military involvement in mining harbors, overflying the country, and blowing up installations in the ports. There were assassinations of hundreds of religious leaders, teachers, health workers, elected officials, and government administrators by U.S.-backed contrast CBS, NBC, and others have footage of all of this; Americas Watch and Witness for Peace have documented it. There was the admission by President Ronald Reagan in his national television debate with Walter Mondale in 1984 that the famous "assassination manual," used to train the contras, was the work of the CIA Station Chief in Tegucigalpa. On national television, Reagan acknowledged the CIA's involvement with the contras and in the plotting of assassinations. After that faux pas, the media asked for clarification from the White House on the President's policies. Did President Reagan in fact approve of assassinations, which had been declared at least officially taboo by President Gerald Ford in 1974? In an exercise of doublespeak, the White House said that the word "assassination" only applied to world leaders and chiefs of state. Murdering regional officials was not assassination. The policy, they said was unchanged. Terror has been a part of this program, terror as raw as anything that happens in the Middle East or elsewhere. The contras habitually went into villages and hauled families out of their homes. They forced children to watch while they castrated and killed their fathers, while they raped their mothers and slashed off their breasts, or they forced parents to watch while they mutilated the children. The New York Times has cited 45,000 as the number of people killed and wounded in this destabilization. This is nobody's propaganda. It was all documented and condemned by the World Court, by the Presbyterian Church, by the Methodist Church, by broad segments of the Catholic Church, and by thousands of witnesses who went down from other countries to see for themselves. Throughout, President Reagan remained unapologetic for this grotesque activity and President Bush continued the same policies. Reagan took pride in saying, "I am a contra. " He took pride in saying that these people were the moral equivalent of his founding fathers. And of course George Bush has never missed a chance to identify himself with the contras. Destabilization has required a relentless propaganda program to discredit the Sandinistas and label them as totalitarian dictators. At first, we were told that they were flying arms into El Salvador. Then, when the Sandinistas put together a military machine to defend their country from the U.S. attack, we were told that they were building a war machine that "threatened the stability of all of Central America. " It was never mentioned that the Nicaraguans did not have strategic weapons and did not have tanks or an air force that could attack other countries, although El Salvador, Honduras, Guatemala, and Panama had been given jet fighter-bombers by the United States. We charged them with censorship after they closed down the La Prensa newspaper. In time it came out that La Prensa had been financed by the National Endowment for Democracy and the CIA. This newspaper was owned by the Chamorro family, which means that Violeta Chamorro, victorious in the 1990 elections and supported by George Bush, was a funded collaborator of the CIA during the period when the CIA was directing the brutalization of her country. Obviously, the United States would never put up with activity like that of La Prensa inside its own borders, especially during a war. In fact, there are laws carefully governing our press on the sensitive issues of capitalism. It is very much against the law, for example, for journalists deliberately to print stories that would cause fluctuations on Wall Street, or even to use "insider" information they obtain in their journalistic research to profit from the exchange. Editors of the Wall StreetJournal have been disciplined for this infraction during the same years that the United States was funding and directing La Prensa to create panics inside Nicaragua and castigating the Sandinistas for "censorship." In 1984, we launched a vigorous campaign to discredit the Nicaraguan elections, elections that were supervised and witnessed by the United Nations and other groups who said that they were as fair as any elections they had seen in Central America in many years. These elections were quite an embarrassment to Ronald Reagan, who was then the champion of the contra program, and I am sure to George Bush today, because they were quite a bit more democratic than the elections that we held in this country during the same year, or in 1988. They had seven parties with candidates running for election; the United States had two. They turned out 75.4 percent of the vote; we turned out 53 percent. They voted directly; we voted for electors who selected our leaders. They passed a law that every legitimate party would have an equal subsidy of funds to spend for campaign purposes; in this country if you can raise more money you can buy more television time and you have a much better chance of the winning the election. Another element of the propaganda program was the claim that they were smuggling drugs to finance their revolution. The CIA staged scenes with the pilot Barry Seales, plea-bargaining a deal with him to land a plane in Panama, to kick some bales of marijuana out on the runway that could be photographed by satellite so President Reagan could put pictures on television saying that it proved the Sandinistas were smuggling drugs. The record, however, proves that the contrasand their CIA managers were smuggling drugs. There was a massive flow of drugs through the CIA/contra aircraft into the United States, where they had clearances to land at Air Force and National Guard bases without being inspected by customs. Senator Kerry's investigation revealed this and there are dozens of cases where people in the contra program, including Adolfo Calero's brother-in-law, were caught smuggling cocaine into this country, using informal "national security" passes or telephone numbers from the White House to get themselves cleared when FBI or Drug Enforcement Agency (DEA) officers caught them. This is nothing new. DEA records have been made public revealing that the CIA intervened on behalf of drug dealers at least two dozen times during the 1970s. The United States also claimed the Sandinistas were responsible for terrorism in Central America, but this case, too, falls flat. The Sandinistas were not involved in terrorist acts- any crimes committed by their soldiers were punished with trials and severe sentences-but the United States has been and still are, slaughtering people in countries like El Salvador and Guatemala. Using the magic of words, U.S. spokespersons like UN Ambassador Jeane Kirkpatrick found a way out. It wasn't "terrorism" if the people responsible for the violence were wearing uniforms provided by U.S. aid. The United States blamed the Sandinistas for misery in Nicaragua, and the country was (and is) in fact miserable that was exactly the stated purpose of the U.S. destabilization. The words in Nicaragua are, "No hay," "There isn't any." There are shortages of everything. The country is suffering; its people are suffering. But U.S. Congressional representatives would go down to Managua and have a look and come back and go on television and say, "You won't believe that place; it is the most miserable country I have ever visited. The Sandinistas have not been able to manage it. Look what happens when you have a Marxist government...." To be honest, obviously they would have said, "Our stated purpose back since 1982 was to break the Nicaraguan economy; we spent a billion dollars destabilizing the country to break its economy. Now here are my snapshots of the results of our successful program." Of course, they do not do that because they are playing propaganda. The country is miserable and it was never the fault of the Sandinistas; misery was the stated purpose of the U.S. contra destabilization program. One can only imagine what schools and clinics and irrigation projects could have been built with $1 billion. And then there was "the Soviet threat." For years, President Reagan said that in Nicaragua we had the Soviets and Cubans in our own backyard. He said there were Russians flying airplanes in this hemisphere meaning into Nicaragua-for the first time in all of history. And like much of what Reagan said-he was never a stickler for accuracy-this was not true. Aeroflot had been flying into Canada, into Mexico, into Latin America, into New York City, for 30 or 40 years on a daily basis, not to mention flying in and out of Cuba continuously. In the end, the Nicaraguan operation was a bittersweet success for Ronald Reagan. He swore, and failed in this promise, that the Sandinistas would be out of office before he was (after his second term ending in 1989). The Sandinistas were eventually ousted, but under President Bush's watch, after Reagan had retired. Meanwhile, Reagan had seen his presidency virtually destroyed in the Iran/contra scandal of 1986. Moreover, President Reagan had failed in his broader goal. He campaigned his way into office in 1980 by advocating war in many of his speeches. He had assured the nation during and after the 1960s that he would have managed the Vietnam War differently. He promised to restore the nation's confidence in its ability to wage war and win. After the invasion of Grenada in October 1983, his constituents sported bumper stickers proclaiming "Nicaragua Next ". "America Feeling Great Again" became the slogan of his 1984 presidential campaign. Meanwhile, the National Guard rehearsed constantly for the invasion of Nicaragua. By the fall of 1986, many respected observers in Washington believed that the date for the invasion had been set for February 1987. There were many indicators. The Pentagon was stirring. Then, in October 1986, the Iran/contra scandal struck. The Reagan administration suffered a number of serious blows: the downing of the Hasenfus plane over Nicaragua, exposure of illegal arms sales to Iran which had held Americans hostage off and on since the Carter presidency, and quite possibly a decision by the nation's non-political financial managers that an invasion of Nicaragua would have disastrous repercussions throughout Latin America. President Reagan was effectively crippled. He may narrowly have escaped impeachment. Certainly, he no longer had the clout to sell a war to the nation and to a reluctant military establishment. Still, the national security establishment will record the U.S. destabilization of Nicaragua as a success. In the 1990 elections, Violeta Chamorro, George Bush's friend and longtime CIA collaborator, won. It was a little-publicized fact that the CIA spent about $20 million on those elections to make the people vote to join their tormenters, a pittance after $1 billion that had already been spent to destabilize the country. Recall the principle of oligarchy through which countries are controlled since overt colonialism became passe. In order to bring countries like Nicaragua into the loops of international finance, you must have people like Chamorro, who will represent the interest of New York bankers, in power. For this to work, the leaders of the oligarchies have to see some real money themselves. This is why people like the Shah in Iran, Mobutu Sese in Zaire, and Ferdinand Marcos in the Philippines have been permitted to steal billions of dollars from the aid and trade that flows through their countries. That's why the U.S. establishment is so adamantly against agrarian reform in Third World countries. If you invested $1 billion in a real land reform program in any country, say El Salvador, it would pay off in huge dividends for the people and perhaps return in ten years or so in the form of improved productivity. But if you loan the same $1 billion to the corrupt oligarchy it comes back to you immediately. In the early 1980s, Morton Halperin of the Center for National Security Studies testified to congressional committees about the decapitalization of El Salvador. For every few million dollars the United States was giving the country in aid, the so-called 14 families were investing a like amount in Miami banks. He quipped that we could save time and effort simply by depositing our aid directly in the rich Salvadorans' Miami bank accounts. The congressmen laughed, but they also voted for more aid to the Salvadoran oligarchy. ... in 1965 the CIA organized an operation to discredit the Communist party in Indonesia. Their strategy was to make the party appear to be secretly planning a violent takeover of Indonesian society. The truth was that the Indonesian Communist Party was doing quite well to obtain representation in the Indonesian government through the democratic process. That was what made it so threatening to the United States. They simply could not have an example of legitimate and successful participation by the Communists in the democratic process. The techniques of the Indonesian destabilization were classic: CIA agents planted caches of arms that would then be "found" by Indonesian police under the watchful eye of the alerted media. Along with the arms would be all kinds of forged documents proving that the Communists were fomenting a violent uprising. Propaganda agents planted stories in the media, inflaming the mistrust of the Communists. Others gave speeches. The situation heated up until some generals in the Indonesian army were killed, and the boil of tension burst. The Indonesian army went after the Communists and the people they felt traditionally supported the Communists. The result was a bloodbath that the New York Times described in terms half a million to a million and a half dead. The Australian secret service, closer to Indonesia, put the figure at closer to two million-the rivers were clogged with the bodies of the dead. In the summer of 1990, the U.S. State Department acknowledged that it had indeed delivered lists of names, of people who were subsequently killed, to the Indonesian government. Twice in the 1960s, the CIA spent large sums of money to influence the outcome of elections in Chile and to install a president of the United States' choosing. Eventually it failed and democracy prevailed in the election of President Salvador Allende Gossens. Under the direction of President Nixon, the CIA organized the famous Track I and Track II destabilization of Chile in order to oust Allende. CIA Deputy Director for Operations, Richard Helms (who later became CIA Director) testified before the congressional Oversight Committee and lied. He was later indicted for lying to the Congress about the Chilean operation and plea-bargained a suspended sentence and a fine, which the association of CIA exes paid for him. Finally, he offered a copy of the notes he had made in the National Security Council meeting in the White House where he was ordered to mount the Chilean operation. He had jotted down the following instructions: "Make the Chilean economy scream." He testified that when he return to CIA headquarters at Langley to give his staff their marching orders, even they were dumfounded at the cynicism of the operation. Helms told them, "Gentlemen, let's not sit around wringing our hands. We've been given a job to do." With the help of the U.S. military, which had solid connections with the Chilean military through the American-sponsored international military fraternity, and with the help of certain multinational corporations like ITT, the CIA mounted the successful operation to oust the democratically-elected president of Chile, who was killed in the process. At one point prior to the coup, General Rene Schneider, the pro-U.S. head of the Chilean military, was an obstacle because he was stubbornly supporting democracy and the constitutional process. So they killed him too and installed the monster Pinochet in power. About 30,000 people were killed by Pinochet, whose secret police were so violent that they even engineered bombings in our own nation's capital. It took the best effort of the Chilean people, eventually with diplomatic help from the United States, to undo the damage and return the country to a democratic process 16 years later. When Henry Kissinger was grilled by the Congress about the Chilean operation, he had this to say: "Yes, the issues are much too important for the Chilean voters to be left to decide for themselves." Coming to grips with these U.S./CIA activities in broad numbers and figuring out how many people have been killed in the jungles of Laos or the hills of Nicaragua is very difficult. But, adding them up as best we can, we come up with a figure of six million people killed-and this is a minimum figure. Included are: one million killed in the Korean War, two million killed in the Vietnam War, 800,000 killed in Indonesia, one million in Cambodia, 20,000 killed in Angola ... and 22,000 killed in Nicaragua. These people would not have died if U.S. tax dollars had not been spent by the CIA to inflame tensions, finance covert political and military activities and destabilize societies. Certainly, there are other local, regional, national and international factors in many of these operations, but if the CIA were tried fairly in a U.S. court, under U.S. law, the principle of complicity, incitement, riot, and mayhem would clearly apply. In the United States, if you hire someone to commit a murder your sentence may be approximately the same as that of the murderer himself. Who are these six million people we have killed in the interest of American national security? Conservatives tell us, "It's a dangerous world. Our enemies have to die so we can be safe and secure." Some of them say, "I'm sorry, but that's the way the world is. We have to accept this reality and defend ourselves, to make our nation safe and insure our way of life." Since 1954, however, we have not parachuted teams into the Soviet Union - our number one enemy - to destabilize that country... Neither do we run these violent operations in England, France, Sweden, Norway, Belgium, or Switzerland. Since the mid-1950s they have all been conducted in Third World countries where governments do not have the power to force the United States to stop its brutal and destabilizing campaigns. One might call this the "Third World War." It is a war that has been fought by the United States against the Third World. Others call it the Cold War and focus on the anti-Communist and anti-Soviet rationales, but the dead are not Soviets; they are people of the Third World. It might also be called the Forty-Year War, like the Thirty-Year and Hundred-Year Wars in Europe, for this one began when the CIA was founded in 1947 and continues today. Altogether, perhaps twenty million people died in the Cold War. As wars go, it has been the second or third most destructive of human life in all of history, after World War I and World War II. Communists? Hardly, since the dead Nicaraguans are predominantly Roman Catholics. Enemies of the United States? That description doesn't fit either, because the thousands of witnesses who have lived in Nicaraguan villages with the people since 1979 testify that the Nicaraguans are the warmest people on the face of the earth, that they love people from the United States, and they simply cannot understand why our leaders would want to spend $1 billion on a contra force designed to murder people and wreck the country. "A man ... an officer who had addressed my training class at the "Farm" in 1965 ... opened up in a surprisingly long way , referring to an adventure in Lumumbashi, dricing about town after curfew with Patrice Lumumba's body in the trunk of his car, trying to decide what to do with it. Five years later I found this man in an Asian post, the chief of station ... And in 1974 I found him again, in a European station..."
"It is the function of the CIA to keep the world unstable, and to propagandize and teach the American people to hate and fear, so we will let the Establishment spend any amount of money on arms." The CIA and the big corporations were, in my experience, in step with each other. Later I realized that they may argue about details of strategy - a small war here or there. However, both are vigorously committed to supporting the system. We created and left behind [in Nicaragua] a National Guard with officers trained in the United States who would be loyal to our interests. This arrangement was the decisive feature of the new era of neocolonialism. The major function of secrecy in Washington is to keep the U.S. people and U.S. Congress from knowing what the nation's leaders are doing. ...the Cambodian people knew that they were being bombed; it was no secret to them. Unfortunately, there was nothing they could do to stop the bombing. However, the people of the United Stares could stop the bombing, or at least raise an effective protest of it. Hence, it was vital to President Nixon that the bombing remain secret here at home. ... the CIA had been running thousands of operations over the years... there have been about 3,000 major covert operations and over 10,000 minor operations... all designed to disrupt, destabilize, or modify the activities of other countries... But they are all illegal and they all disrupt the normal functioning, often the democratic functioning, of other societies. They raise serious questions about the moral responsibility of the United States in the international society of nations. ...the CIA has overthrown functioning democracies in over 20 countries. ...stirring up deadly ethnic and racial strife has been a standard technique used by the CIA. Nothing illustrates the power to rationalize cynicism as well as the Public Safety Program, also called the Office of Public Safety. For about twenty-five years, the CIA, working through the Agency for International Development, trained and organized police and paramilitary officers from around the world in techniques of population control, repression, and torture. Schools were set up in the United States, Panama, and Asia, from which tens of thousands graduated. In some cases, former Nazi officers from Hitler's Third Reich were used as instructors. The major economic impetus behind the Third World War ... is the production of arms. Every day $3 billion worth of weapons is bought and sold. So-called defense corporations are making 20-25 percent profit. In the 1980s, the United States spent a total of $2.5 trillion (at least those were the announced figures, the total was probably much greater) on the largest arms buildup perhaps in the history of the world and certainly of any country during peacetime. The U.S. taxpayer is now carrying a gigantic burden. Nearly one-third of the nation's budget goes to the military. According to studies published in the Washington Post, 53 cents of every tax dollar goes to the military to pay for arms, salaries, facilities, overhead, and debts from Vietnam and other wars. This was the continuation of a post-World War II system, dominated by what President Eisenhower called the "military-industrial complex." The U.S. taxpayer is now carrying a gigantic burden. Nearly one-third of the nation's budget goes to the military. According to studies published in the Washington Post, 53 cents of every dollar goes to the military to pay for arms, salaries, facilities, overhead, and debts from Vietnam and other wars. Taking smoothly over from the arcade games, which are nearly all violent, our society feeds its youth on the great military conditioning program of football, complete with the captain (coach), the sergeant (quarterback), and troops. The lesson of the runaway arms race, with its giant expenditures on the military, is that the nation has gone deeply, irreversibly into debt, and every conceivable social service is being sacrificed. We cannot afford guns and butter. To pay for the arms race the nation has to cut thousands of social programs, ... The nation cannot go wild on military expenditures and also afford to care for old people, poor people, disabled people, farmers, or students. ... the United States has plummeted, relative to the rest of the industrialized world, from its pinnacle of wealth and economic strength. Twenty-five percent of the people in this country are now functionally illiterate. We are sixth in the world in terms of the percentage of children in school; seventh in life expectancy; tenth in quality of education; tenth in quality of life standards; and twentieth in infant mortality. Conservative intellectuals admit the harshness of U.S. counter-revolutionary activities but argue that they are necessary.... They know that people die by the thousands in these activities, but claim that they are nevertheless necessary to maintain U.S. security and the U.S. standard of living. The First Amendment does not require anyone to publish the truth. The owners of the Washington Post long ago acknowledged that the Post is the government's voice to the people. In 1981, Katherine Graham, who owns the Post and Newsweek announced that her editors would "cooperate with the national security interests." National security in this context means "CIA." ... the CIA [has] been running thousands of operations over the years. ... there have been about 3,000 major covert operations and over 10,000 minor operations-all illegal, and all designed to disrupt, destabilize, or modify the activities of other countries. The major function of secrecy in Washington is to keep the U.S. people and U.S. Congress from knowing what the nation's leaders are doing. Secrecy is power. Secrecy is license. Secrecy covers up mistakes. Secrecy covers up corruption. The current War on Drugs, with its broad rationales for aggressive response, police action, and stringent new laws, has quickly replaced the old anti-Christ of Communism in the hearts and minds of the national security establishment. The so-called "defense" corporations are multinational conglomerates that have no great loyalty to the United States; they are in fact no longer U.S. corporations but transnational entities loyal only to themselves. Now more clearly than ever, the CIA, with its related institutions, is exposed as an agency of destabilization and repression. Throughout its history, it has organized secret wars that killed millions of people in the Third World who had no capability of doing physical harm to the United States. ... the United States [is] cast in the role of Praetorian Guard, protecting the interests of the global financial order against fractious elements in the Third World. The military has ... seen its budget restored, to an all-time high, and it has ...new rationales for continued dominance of U.S. society. The Third World is the new enemy, effectively replacing the Cold War rationales for militarism. 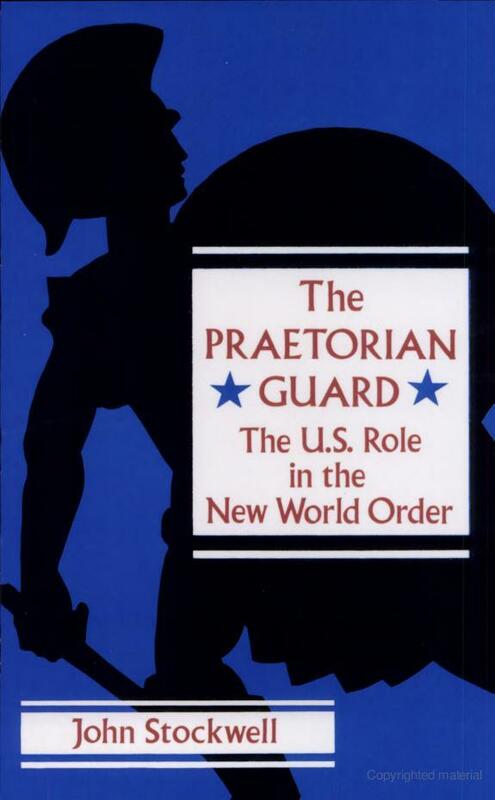 As the Praetorian Guard, fighting wars for multinational interests while also paying for such adventures, our relative economic stability, domestic social and material infrastructure, and the freedom and liberties of the American people may all be forfeited. The six million people the CIA has helped to kill are people of the Mitumba Mountains of the Congo, the jungles of Southeast Asia, and the hills of northern Nicaragua. They are people without ICBMs or armies or navies, incapable of doing physical damage to the United States the 22,000 killed in Nicaragua, for example, are not Russians; they are not Cuban soldiers or advisors; they are not even mostly Sandinistas. A majority are rag-poor peasants, including large numbers of women and children.